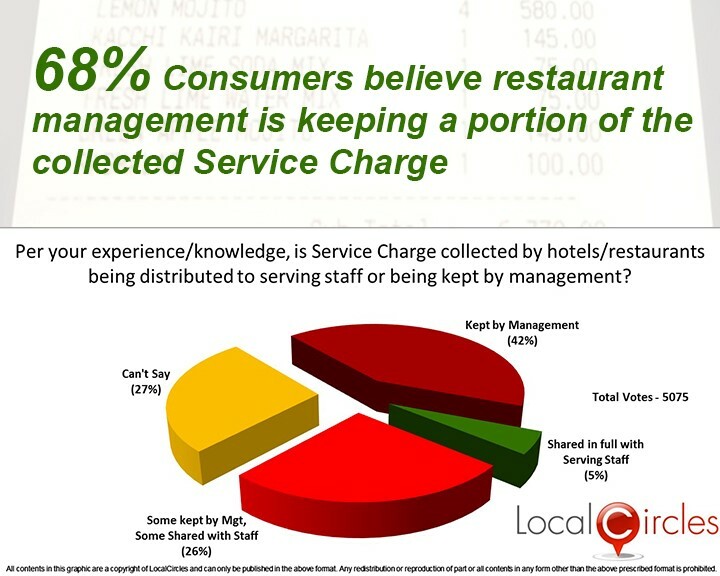 April 25, 2017, New Delhi: A majority of the citizens who voted in a recent LocalCircles survey said that the amount collected as service charge by restaurants does not go to the staff entirely and the management keeps a portion of it for themselves. 42% of the 5075 citizens who voted in this survey believe that the service charge amount is completely kept by the management whereas 26% believe that only a part of it is shared with the staff. Only 5% believe that it is completely distributed amongst the staff. Service Charge has become a major issue of contention as most hotels and restaurants are levying this charge in their bills and some consumers do not even know that the service charge is nothing but a tip that is being forcefully taken from them. This means that the distrust with the collection and utilization of this charge is very high among consumers. 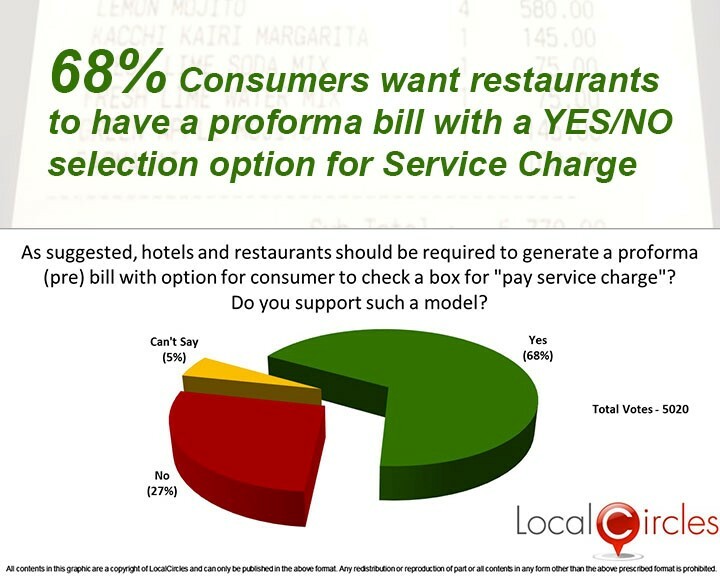 In a parallel poll, over two-thirds of the consumers have opted for restaurant bills to include a YES, NO check box for Service Charge. The final amount charged to the consumer should be based on their selection. Over 5000 consumers participated in each one of the 3 polls with over 10000 consumers participating in the survey. The rationale offered for levying a compulsory service charge on all consumers by restaurants is that it ensures that a tip is paid to their serving staff. But per the Government, a tip is considered as voluntary and has to be a choice that consumers should exercise. 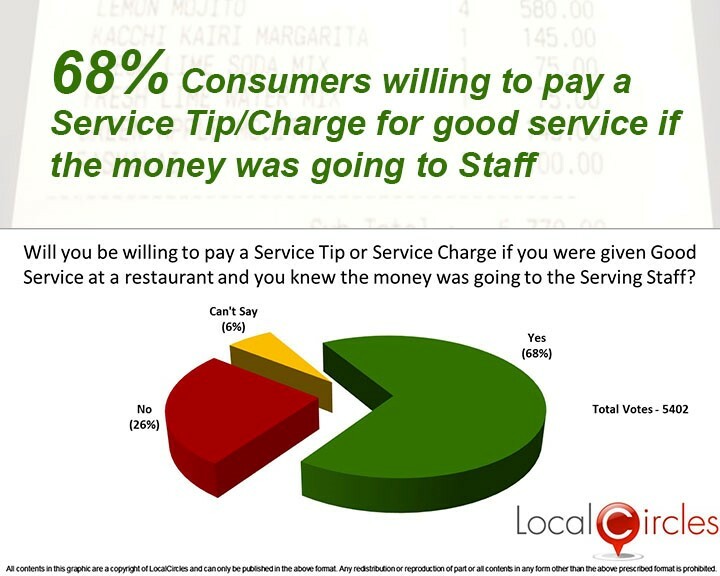 The results of the third poll show that almost 68% of the consumers are willing to pay a tip to the serving staff if they feel the service rendered to them as good and going to the staff. Only 26 % of the consumers are not willing to pay the tip, while 6% can’t say. This means that a large majority are in favour of paying a tip, but due to a small minority the tip has been made compulsory in the form of a service charge. Post the Service Charge advisory issued on Apr 21st, 2017, the restaurant and hotel associations have been adamant on the fact that they will keep charging the service charge. Their point of view is that the Ministry of Consumer Affairs has issued an advisory and not an order. They say that they will not budge from their stance till a law is passed by the government prohibiting them from charging a service charge. LocalCircles, India’s leading Community Social Media platform takes Social Media to the next level and makes it about Communities, Governance and Utility. 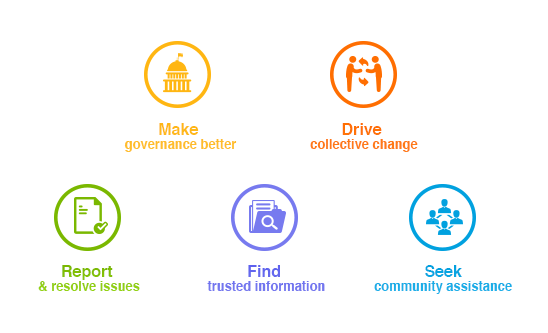 It enables citizens to connect with communities for most aspects of urban daily life like Neighborhood, Constituency, City, Government, Causes, Interests and Needs, seek information/assistance when needed, come together for various initiatives and improve their urban daily life. LocalCircles is free for citizens and always will be!